Do I have to bi-amp or bi-wire my connections with your speakers? How do I use the bi-wiring connections to increase the performance of my system? How do I use the bi-amplification connections to increase the performance of my system? Some of our models have speaker wire connections to allow for bi-amplification or bi-wiring. This is for your benefit and can be used to enhance the performance of your system. Connection of a basic audio system where there is only one connection from the amplifier is very simple and bi-amp or bi-wire is not necessary. You can connect your speakers using the regular left and right speaker wire connections and ignore the second set of terminals. As these speakers are shipped from us, there are gold-plated bridges connecting the two sets of terminals that allow the speaker to be connected as a traditional loudspeaker. Only remove these bridges if you plan to bi-wire or bi-amp your speakers. The bi-wire connection separates the woofer from the combined midrange and tweeter section. A bi-wire compatible speaker has 4 binding post terminals. These two sets of terminals allows the speaker to be split into two independent sections. The split connects the mid and high frequency drivers to one set of terminals and the low frequency driver to the other pair. 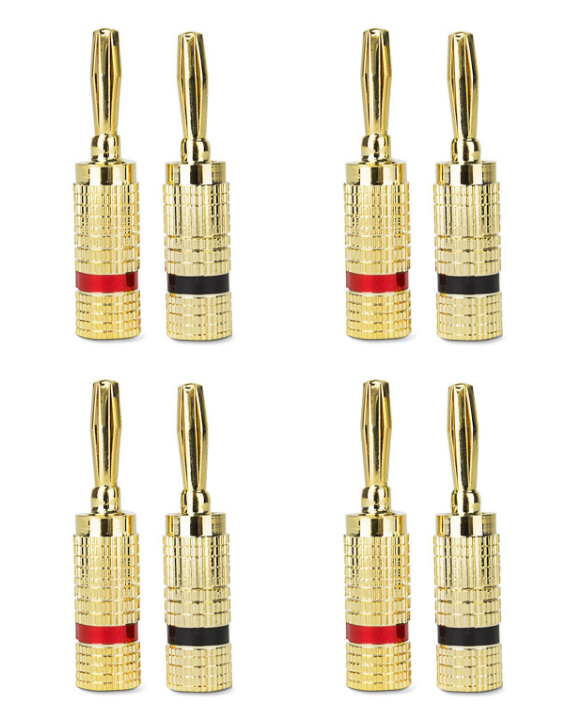 As these speakers are shipped from us, there are gold-plated bridges connecting the two sets of terminals that allow the speaker to be connected as a traditional loudspeaker. In the bi-wire speaker connection the bridges are removed and separate sets of speaker wire are run from the amplifier to each section as shown below. Ensure that your system is powered OFF. Remove the bi-wire bridges from each speaker (this separates the LPF & HPF crossovers). 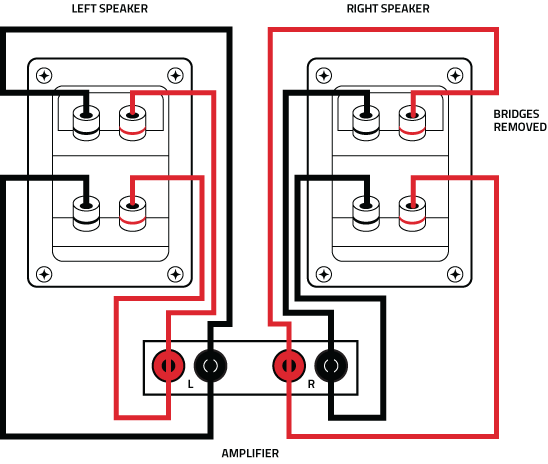 Connect each amplifier channel to its respective speaker section as shown. 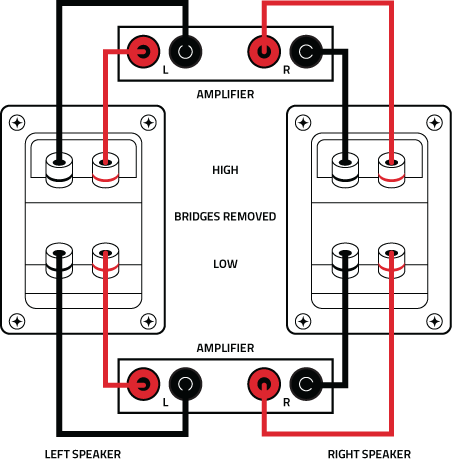 When connecting speaker wire take care to maintain the correct polarity (+ or RED) to (+ or RED) and (- or BLACK) to (- or BLACK). 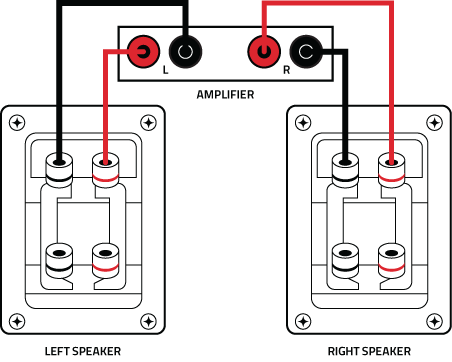 Before attempting the connection make sure that your amplifier’s speaker wire connectors will accept a second set of cables and that the equipment is turned OFF while you make the connections. For anyone willing to take the trouble, the sonic rewards are outstanding in a bi-amp system. There will be many obvious improvements in the sound, everything will be clearer and tighter. Bi-amplification is the use of two amplifiers for both speakers. One amplifier is connected to the woofer section of a loudspeaker while the other is connected to the combined mid and tweeter section. With this arrangement each amplifier operates over a restricted frequency range. This restricted range presents each amplifier with a much simpler job and each amplifier is less likely to “influence” the sound in some way. The speaker’s internal crossover consists of a LPF (low pass filter) and a HPF (high pass filter). As its name implies the LPF passes frequencies below a cutoff and rejects frequencies above the cutoff frequency. Likewise, the HPF passes frequencies above its cutoff. Set the level controls on the amplifiers such that the signal will arrive at all speaker terminals at the same power-volume level. If your amplifiers are identical, it is usually sufficient to set all the amplifier level controls the same. The speaker’s built-in crossover is designed to match the efficiency of all the individual drivers (tweeters, midranges, and woofers). When using the bi-amplifier connection you must directly deal with some of these issues by adjusting levels according to your listening preference. Above, we’ve shown our preferred setup using one stereo amplifier for each frequency range. If your amplifiers are not identical, use the more powerful amplifier for the low sections and the cleaner (better sounding) amplifier for the high sections.